My first electronic caller or e-caller was a Walkman cassette player and a set of amplified speakers. 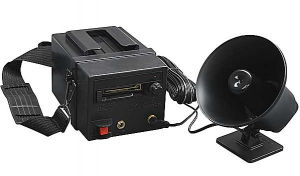 If you didn’t keep the caller right by your side you could not change sounds (cassettes) on a stand. It was basically a drop and set cassette tape game caller. Since the speakers were attached to the Walkman cassette player with a 2 foot cord, you would set the caller and speakers down, press play and hustle back to the spot where you sat on each setup. There was no remote control or changing sounds. You chose a sound, it constantly played for the entire stand and that was it. I did change one side of several of my cassettes to have 2 or 3 minutes of silence at the beginning of the tape. This was done by putting a piece of tape over the knockout in the top of the cassette tape and recording the silence with a tape recorder and a mic jack plug. This would give me 2 to 3 minutes to get to my spot and get ready before the sound started playing. Pretty primitive electronic calling at the time, but effective. The next setup I had was the Lohman electronic cassette caller, which was basically a copy of the Johnny Stewart JS512. 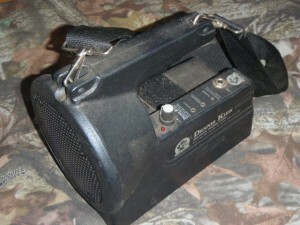 This heavy cassette caller with an amplifier had a 12 volt rechargeable battery and a horn speaker. At first, I used the caller with a 50 foot speaker wire attachment which with the 25 feet that came with the caller, gave me 75 feet of wire to unroll and then roll up after each stand. This was remote control 20 years ago. At least you could change sounds on stand without getting up. The first remote control caller I had was when I modified the Lohman caller to work with an Azden wireless microphone setup I bought at the local music shop. 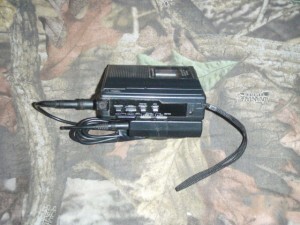 Some wiring on the cassette player part was changed, the wireless receiver was attached to the Lohman caller and the wireless mic was attached to a Radio Shack cassette tape player. This worked really well for the most part, but it didn’t have a lot of range and it was staticy and crude with clicks, pops and white noise when you powered it up and changed sounds. The Azden setup seemed to work better and the sound was much clearer the further I was from civilization. This was probably due to the frequencies of the wireless mic conflicting with other signals. I also bought a remote control Dennis Kirk Cassette Caller that came with a Walkman casette player and the Azden wireless microphone setup. The Dennis Kirk caller is a bit lighter than the Lohman, because it uses C batteries as opposed to a big 12v battery and has a cone speaker in it which sounds different than the horn speaker on the Lohman. The cone speaker sounds different than the horn speaker depending on what the pitch of the sound being played is. 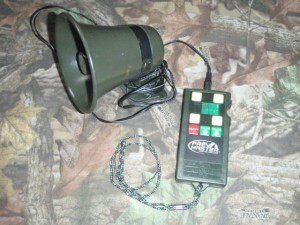 The new Foxpro Firestorm digital caller has one of each of these types of speakers in it, but that’s a whole other post. The next caller I got was the Johnny Stewart Preymaster, which was my first digital caller. 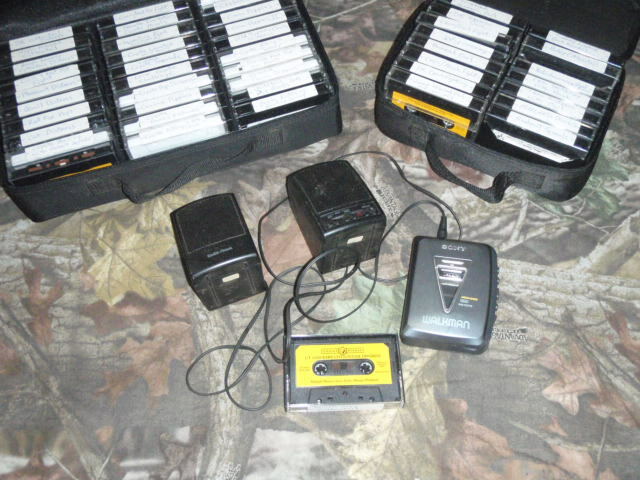 The Preymaster uses digital sounds via cartridges or chips instead of cassette tapes. The sound was clearer, but it still had a speaker wire and no remote. I modified it to work with the Azden wireless mic setup, but it still was plagued by clicks and static due to the frequencies of the wireless mic. There are many different digital electronic game callers out these days. These range from homemade setups made from a $20 MP3 player and speakers, which is basically like my first setup only with digital sounds (MP3, WAV, etc…) instead of cassettes, to high end digital game callers costing hundreds of dollars. 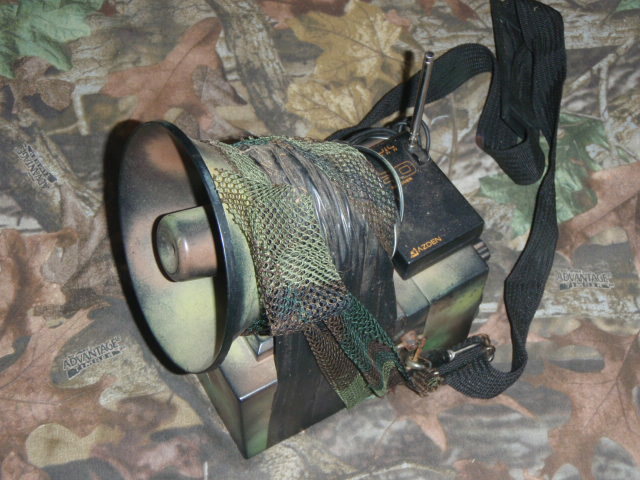 My current modern digital caller is the Western Rivers Nite Stalker. 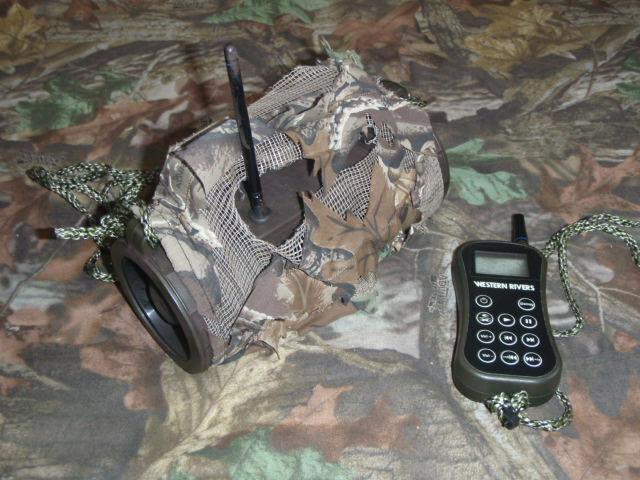 The Nite Stalker is compact, holds up to 400 sounds and has a fully functional long distance remote. 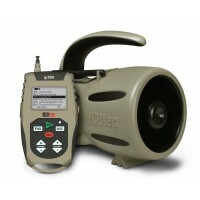 Gone are the days of rolling out 75 feet of speaker wire, clicks, pops and white noise. All I can say is, electronic callers have come a long way over the last 20 or so years. How much for the Dennis Kirk Cassette caller. I’m waiting for your reply, I’ll pay you by cashiers check. I’m really anchuous to hear from you please reply? Thank you for your interest, but the Dennis Kirk cassette caller is not for sale. I need a horn/speaker for a Johnny Stewart cassette deluxe game caller. I do not know wattage or ohms requirement. I would like to buy a cassette caller as I have many cassettes. Do you have any for sale?